Sauls of Spratton Ltd have been run by the Sauls family since 1926 and have provided meats of outstanding quality in a traditional way from our shop in the village of Spratton in Northamptonshire. Smithfield Award for Excellence and Innovation, National Diamond Award for our Diamond Pie and the Confrerie des Chevaliers Du Goute-Bourdin for our black pudding. In 2005 we were proud to be awarded the Meat and Poultry News' National Retailer of the Year. Nowadays we make all our own sausages, pork pies, meat pies, pates and potted beef, sausage rolls, cornish pasties, ready meals and bread. We use only the best and freshest ingredients and follow our traditional family recipes to produce the best food that we can. 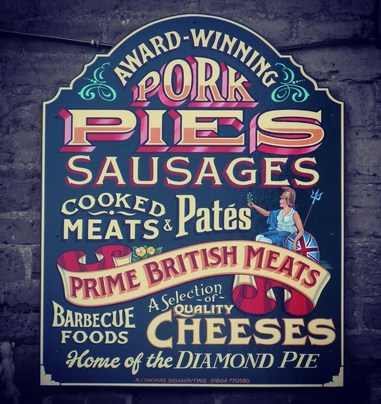 , not just pork rolls but sausages, burgers and any combination of carvery meats. To find out how we can help provide for the discerning customers at your event, click on the Sauls Events Catering tab at the top of the page or contact us on 01604 847214. In 2009 we are proud to announce that our potted beef won the county's Best Local Product in the Northamptonshire Food and Drink awards organised by Northamptonshire Enterprise Limited. It was the first time these awards have been held and judging by a panel of experts including Saints prop Euan Murray was held at the Holdenby House Food Fair. The winning trophy was presented to Chris and his daughter Emma by Chef Sophie Grigson.Since 1926, Sauls butchers have been providing meats of outstanding quality in the traditional way from our butchers shop in Spratton in Northamptonshire. We produce everything we sell from sausages and home cured bacon to ready meals or our award winning pies, pates and ready meals. We only use the freshest ingredients from the best suppliers which is why we support British Meats.